Cody, Dakota and I are thrilled to be a part of the Wordy Wednesday Challenge that is being sponsored by Zoolatry and Sammy, Andy and Shelly's Place. We are just ecstatic about our wonderful photos! Thanks so much for all of the hard work involved in creating such marvelous photos for all of us who are participating in this super fun event! Every dog has a "job"
that we live in is lucky. Dakota is "on it" every hour of the day! Oh my oh my! Theese are such fabulous pics and such cute stories! Way to go! Great post! Love the photos too. Second I love the Photos of Cody and Dakota, and your little poems are so sweet. HUGS! Eek our comment vanished AGAIN! We said we love Dakota's pic and cuddly Cody too. We just love your Wordy Wednesday pictures!! You two are so cute and we loved the stories about each of you, too!! VERY VERY Beautiful pictures ! I think you mom should frame the pictures, Look very cute !!! and your mom is very very sweet : ) She chose lovely words for both of you. ROTFLOL!!!! The doggerel had me in stitches! purrrr....meow! Wot adorable pics of Cody and Dakota. We LOVE them. Two awesome pets indeed for the "wordy challenge". Love those photos Caren. @Cloon, thanks so much! We love them! Glad you liked the stories too! @Diane thanks so much! They did such a fabulous job on the photos, I love them! @Milo and Alfie thank you! I love them too! @Cat-In-Sydney, you think sooo much like me! Dakota's was my fave! I can't look at it without cracking up laughing!! @Mr.Puddy, Happy, Happy Wordy Wednesday to YOU too!! I LOVED yours as well! I think that is a great idea to frame these. I probably will. We are going to paint an extra room for an office for me and I think I will frame them and put them in there! Glad you liked the words also Puddy! Love ya! @Samantha, Clementine and Maverick, we had such a fun time with this! It was so nice of Ann and Judi to have this! We love our photos and thanks so much! @Raymond and Busby thanks so much! We just adore these photos! Thos are great pictures. Dakota is looking extra alert too. And, of course, Cody is looking his sweet adorable self. Oh, I love this post so much, Caren!!! Little Cody is so cuddly but don't be fooled by his cutie look, he is in fact an excellent mountain climber. Dakota is a vocal who is honest and diligent. He is the protector of the family and never fails his duties! Bravo to Cody and Dakota!!! Great words! Dakota, I can tell you have lots of important things to say! Yay for cuddly Cody and vocal Dakota!!!! Yay!!!!! How lucky you are to have both a cuddler and a protector. Cody has the most precious face. He just looks like a cuddle kitty. Those are great words and wonderful graphics. Well done to Ann and Judi! Love the pictures and the stories! Very creative! Can I join Dakota at the microphone?? So nice to meet Cody and Dakota, they're definitely cuties! I had a kitten that once climbed up my bathrobe while I was getting her food dish ready. I guess she just couldn't wait! @Mario thanks so much! That photo of Dakota is my very favorite!!! It really shows his personality! @Ginger Jasper, I am getting your comments, not to worry! That happens to Priscilla too and I am so sorry. I don't know why it happens but I am getting the comments and I definitely appreciate them! So glad you enjoyed the photos and the words! @Jen thanks so much! I love the photos and glad you liked the words! @Kea yes Ann and Judi did an amazing job! @Old Kitty, so glad you enjoyed these!! Hugs to you and Charlie!! @Mr Pip, Dakota said to tell you OHHHH YESSS he has TONS of important things to say! What wonderful pictures of Cody and Dakota... Beautiful. congrats! i gave you an award! What wonderful pictures! Me particularly loves Cody - cuz he is such a handsome cat and Dakota cus the picture is so cute. My hairy slobbery sister Bob is 1/2 sheltie! 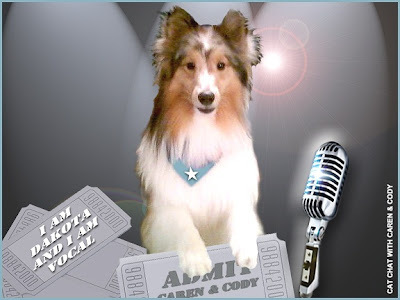 Me knows about the vocal and the herding! I love you pictures and your words, they are purrfect for you! I share Dakota's penchant for self-expression. You may have noticed. Excellent! Great words for everyone! I wish all the bests to You and to Your family! so cute! I love that cody is a snuggler! Aww! Both of those are great pics. Cody looks like he's talking to his Mom. Terrific choice of words and fabulous graphics! Those are great words and pictures for you! Awesome pics (and great commentary!) of two wonderful pets. You're very blessed! Loved hearing the stories behind Cody and Dakota's words. Very fitting pics for them. @Mumsy THANK YOU! Dakota having his own talk show? I love it!! I AM thinking about having Dakota have his OWN blog though! I am still in the "thinking about it" stage. @Cats of Wildcat Woods thanks so much! Ann and Judi did a great job on the pics! @The Paw Relations thank you so much! @Abby thank you!!! We just love the photos! @Gina awwww you are welcome! Thank you! I love your blog! I ADORE reading about food (and of course eating it! lol) you have some great ideas and recipes! :) Thanks for stopping by! @Amin you are so kind and so sweet! Your baby girl is lucky to have you as her Daddy! Can't wait to hear her name and I hope you have seen her by now. Hope your wife is feeling well! @Brian thank you! I have to get around to all of the blogs later. I have been so busy with phone calls and visitors today that I have barely had a free moment! Great words and wonderful graphics! You're both cute too! @Stacy and Ellie thanks much! I love my cuddly boy too! @ The Monkeys thank you!! Those are both great pictures. 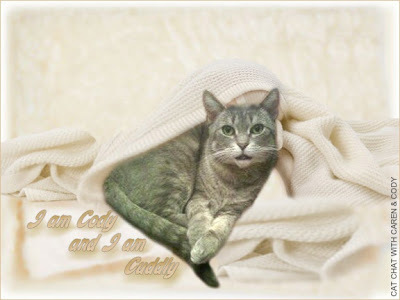 Cody looks very cuddly in his blankie, and that is a fun picture of Dakota. @Eric and Flynn thank you!! We are just tickled with our photos too! @meowmeowmans thank you! We love our photos! Excellent words!! And we love your pictures! We wanna cuddle up with Cody!! PS ~ love the new profile photo. Terrific words for you both Cody and Dakota. This Challenge has been lots of fun, hasn't it? I haven't seen any two word choices the same! Great photos! And I love the stories. @Natalie thanks so much! We love the photos too! Thanks about the stories as well! @Simba thanks a million. OMG YES the challenge has been a total blast! I loved hearing about how all the Hoomans described their kitties! You know what? you are exactly right! Nobody picked the same words! I didn't think about that til you mentioned it! The Human envies you with your Cuddly Cody. But you know? Too bad for her, MOL! Ha ha ha. She'll have to find her cuddles elsewhere (well, IF she brushes me with my very very favorite pink brushie, then MAYBE I'll stay on her lap for a few minutes). Cuddly and Vocal are both great words. Cody's picture exemplifies that word. And I'm sure Dakota has a lot to be vocal about...maybe mostly his love for you!